Through acupuncture, we effectively flush out allergens and reduce swelling of the sinus cavity, which in turn relieves discomfort such as headache and pain in the face. There are many types of sinus problems, including allergy symptoms. Some sufferers experience repetitive sinus infections. Some physicians view sinusitis as being related to a person's genetic disposition. Chinese medicine looks at this problem with a somewhat different view than Western medical practitioners. Traditional Chinese medicine looks at sinusitis as fluid stasis, or the inability of the lungs to disperse water, with excessive fluid retention causing the problem. We know that many times sinus problems get worse when the weather is damp; the sinuses being adversely affected by moisture. Sinus allergy symptoms occur when the body is hypersensitive to allergens. The body's reaction is increased secretion. This over-reaction, is the body's way of trying to flush out the allergen. Symptoms such as tearing eyes and a runny nose are evidence of this flushing out process. 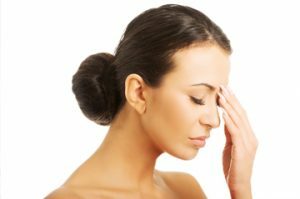 If the sinus cavity is blocked, backup pressure can cause a secondary headache and a "stuffed-up" nose. Under these circumstances, many patients will not respond well to antihistamines or steroids, except for systemic injections of steroids directly into the bloodstream. Practitioners of Chinese medicine view sinusitis as the body's inability to cope with a specific allergen(s) due to fluid stasis. We notice many people develop allergies later in life and that often times these people also have an associated digestive disorder and/or lung problem. Persons with Fibromyalgia, kidney or liver problems may have increased incidence of allergy discomfort because these conditions can reduce fluid circulation in the body. With fluid trapped, circulation slows down and the body cannot wash the allergens out in a timely manner. Acupuncture, when gently applied to the face, has proven to be highly effective in increasing fluid circulation in the sinus cavity. Patients have reported the experience as "having opened the flood gates." Through acupuncture, we effectively flush out allergens and reduce swelling of the sinus cavity, which in turn relieves discomfort such as headache and pain in the face.